This is the ultimate sparring headgear for face protection. The headgear itself is made of high density foam with a faux leather covering. The inner shell allows for shock reducing protection and absorbs strikes. There is protection for the entire head including the chin and back of head. Top of the headgear features padding for protection while weapons sparring. There is reinforced padding around the ears and the back has a Velcro strap to ensure a tight fit. The cage is made of dense reinforced plastic to ensure ultimate protection. The design allows for great vision while still ensuring maximum face protection. 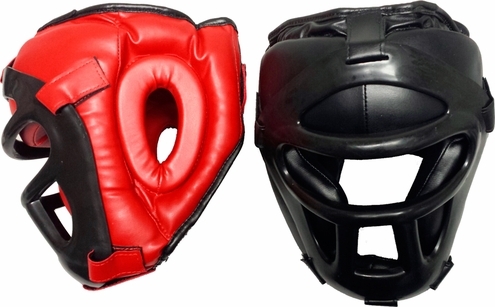 The cage is also removable which can come in handy if your sparring doesn�t need the added cage feature. This headgear is great for sparring with weapons or general sparring. It offers additional eye protection which is essential for people who wear glasses or contacts. The headgear comes in red or black and is available in a small/medium or large/x-large. For a version without a cage check out our Full Headgear..